Rail tickets in the UK can be bought in advance, or on day of traveling. The secret of obtaining a cheap deal is to buy your ticket early. You can save anything from 39% up to 80 % just by buying your UK railways ticket in advance, up to 18:00 the evening before the intended travel day. 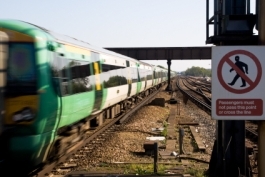 Always check to see if you qualify to use a railcard to make even more savings. Whether you are coming in from outside the UK for a visit or you already here, you can buy your online here and get it delivered to your address anywhere in the world. Buying rail tickets in the UK used to involve a trip to the local station to get a ticket, or going to a travel agent and getting your ticket there. But those days have changed. Buy your UK rail tickets online. There are lots of ways that you can get a cheap UK rail tickets and let your money go further. They include the following. As soon as you have decided on a date for travel, try to buy your ticket that day. Trains have a certain percentage of cheap seats, and if you leave it too late all those will be gone and you'll end up spending more money than you intended. Give yourself plenty of time. The best deals are secured if you buy your UK rail tickets as early as three months before your intended travel day. You can check out the fare for your journey anytime up to three months early here and even buy your rail ticket by using the box below. If you are looking for cheap rail tickets in the UK for your journey and only get to know of your exact destination a few days or up to even just the night before your travel day, you can still get great bargains. Book your ticket online at up to 18:00 hours that evening before your travel day, or call a help line on 0845-748-4950. If you travel to work or college everyday, you can also use this technique to save on your UK rail tickets. A shocking example of how booking early could save you significant cost is presented in the book - Rick Steves' England 2008. There it showed how a "London-York round-trip (standard class), the full fare, with no date stipulated for the return trip, is £170; if you book the day of departure for travel after 9:30, it's £71; and the cheapest fare, booked a couple of months in advance as two one way tickets, is £20". Believe it. Save massively on your rail tickets in the UK by buying your ticket in advance. You can read more tips from Rick Steves' England 2008 to save money and get information on top places to visit in England, if you are planning a trip to England from outside the UK. Buy one from www.amazon.co.uk . Another good way of saving yourself a few pounds, if you are not in a rush is to buy tickets to start your journey after the rush hour. As a general rule, if you can buy a ticket for after 09:30 in the morning then you will find that the costs will be lower. Plus, you may need to come home after 18:30 or so, if you are traveling back from London or indeed any of your chosen destination. Getting a round the trip or cheap advance return ticket for your whole trip may not always be truly cheap. Always try out what the cost is if you split the journey into two or more legs. This is particular important if you use a seasons ticket. There are lots of ways to actually get your ticket. One of the easiest ways is to go online and check out the availability of seats, particularly those at a good price. Then you can check out the prices for various different times that are convenient to you. There are some good deals to be had, so you can check out discounted rail ticket sites. You can still buy a ticket in person at a railway station. This is possibly the best way if you are making a short journey, or you are buying a Day Trip return, since these prices are usually static. You can also buy a ticket by phoning the National Rail Enquiries line. They'll be able to check prices for you and tell you availability. This is good if you are very flexible about your travel arrangements. With these different ways of buying rail tickets in the UK, it is obvious that it is an easy and straightforward process that simply helps people enjoy the delights of the railways. Return to "UK Heritage Railways" from "Buying Rail Tickets in the UK"